Poll averaging, with various weightings, adjustments, and other secret-sauce mumbo-jumbo, is all the rage for federal elections, so I thought I’d try it here, since we have a relative bonanza of polling data. I think the rankings in the Mayor’s race would conform with most people’s general impressions – I had Costello ahead of Bell, and Garcia ahead of King, before I filled in the numbers, but otherwise they are all where I placed them initially. Basically, Turner is by himself, Garcia and King are tied for second, and Bell and Costello are a notch behind them. Hall and McVey are non-factors. There are still enough undecideds to possibly shake things up a bit, though how many of those “undecideds” are actually non-voters is an open question. As for HERO, that HRBC poll with the slanted wording is an outlier, and may not be as accurate as the others on this question. Without it, HERO prevails by a 46.3 to 36.7 margin, a much more comfortable margin than if we include the HRBC poll. I’m not inclined to throw it out on the grounds of having no idea what the turnout effect for HERO will be, and not knowing what effect the shriekingly hateful anti-HERO campaign will have. As I’ve said before, I feel optimistic but not yet confident. I was pleased to see a HERO endorsement in the African-American News, which one hopes will help counter this nasty anti-HERO op-ed from two weeks earlier. I really don’t know what I expected going into this, but I feel like there have been more positive surprises than negative ones. The biggest area of uncertainty for me is in the downballot races. Ben Hall’s anemic poll numbers suggests that there just aren’t that many voters for whom being anti-HERO is their main or only issue. There are obviously a lot more anti-HERO voters than what Hall’s numbers show, but the combined numbers for Hall and King suggest that some number of them will be voting for at least some pro-HERO candidates. If that attitude prevails in Council races, I think we’ll mostly get good outcomes. If not, there could be some ugly runoffs. I think all contested Council incumbents are in decent shape, though any of these five (listed in descending order of likelihood) could wind up in a runoff: Nguyen, Christie, Laster, Robinson, Kubosh. We could have a very busy November. UPDATE: It helps to do the arithmetic right if one is going to aggregate polls. I goofed on the King numbers, which is why I originally had him second, but on review I see I gave him too high a total. What’s there now is correct. My apologies for the error. Thursday, the Houston Realty Business Coalition (HRBC) released a poll of 428 active voters measuring support of Mayoral candidates and important issues facing city voters. The Survey was conducted October 5-6. The poll shows King has emerged from the pack of major mayoral candidates running very close to the presumed frontrunner. Only 13% of Houston voters say they have yet to decide who they will support in the upcoming election. BALLOT: If the election for Mayor was held today and these were your choices: Ben Hall, Sylvester Turner, Adrian Garcia, Bill King, Steve Costello, and Chris Bell, who would you vote for? HERO ORDINANCE: Do you support the City of Houston’s Prop 1 ordinance, often referred to as the HERO ordinance – the law among other things would ban discrimination based on sexual orientation or gender identity? PENSION: Currently the City of Houston has $3.1 billion in unfunded pension liabilities and has little to no control of the pension funds. Would you support a proposal that would return control of pension funds to the Mayor and allow him to negotiate necessary changes to the current pensions? The sample size for the survey is 428 targeted voters in Houston, Texas. The margin of error is +/- 4.77%. All interviews were completed using automated telephone technology and were conducted October 5-6, 2015 by TargetPoint Consulting. The total percentages for responses may not equal 100% due to rounding. Full poll data is here. I said yesterday that we might get another poll that doesn’t agree with the HAR poll, I just didn’t expect one so quickly. A couple of things to note: One, in comparison to the HAR poll data, this sample is more Republican, but also younger and slightly less white. I’m gonna guess that means more west side/Clear Lake/Kingwood and less Montrose/Heights/Meyerland. It also highlights the importance of how questions are asked. Note here that the HERO question only refers to “sexual orientation or gender identity”, whereas the HAR poll mirrors the ballot language, which lists all the protected classes under HERO. This is Polling Methodology 101 here, and it’s no coincidence that HAR supports HERO while the HRBC opposes HERO and has backed a slate of candidates (including King) that opposes it as well. There’s nothing wrong with this approach – needless to say, it’s the way HERO opponents are doing their messaging, and very much the way they want people to think about Prop 1 when they vote – but it doesn’t mean this sample is “wrong” and the other one is “right”. It means that messages and campaigns matter, which is why it’s nice that HERO proponents have plenty of resources to get their message out. UPDATE: Here’s the Chron story, which makes the same points I do. I kid, I kid. Like it or not, HERO or not, it’s what this race has been about. 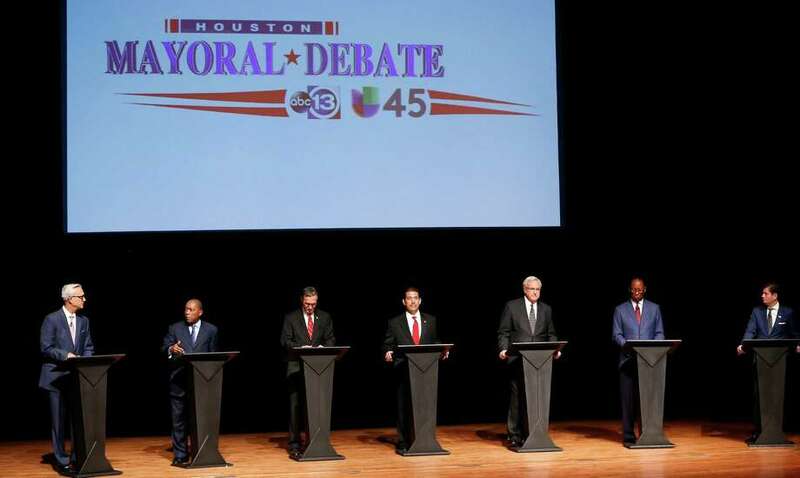 The top candidates for Houston mayor are talking far more about the city’s growing cost of retiree benefits than voters are, which is, in some ways, a testament to the profound challenge presented by the city’s pension burden. Sure, potholes, policing and parks have all gotten ample focus in the campaign, but when such core political talking points are available, why risk putting voters to sleep with talk of actuarial projections and unfunded liabilities? In short, because paying the rising pension bill could play a role in preventing the new mayor from funding other items, said Rice University political scientist Mark Jones. The top seven mayoral hopefuls, to varying degrees, acknowledge pension reform is needed but disagree on the details. You can read the rest for yourself. It’s not anything you haven’t heard before if you’ve been following the campaigns. I don’t know that I have anything to add that I haven’t said before, so I’ll just say that this is a topic that will be discussed in the Mayoral interviews that I am conducting/have conducted. Those will run beginning on Monday. This is the sixth in a series of profiles on the top candidates running for mayor in Houston. Standing in his sparse west Houston office this summer, Marty McVey traced his route to victory across a city map hung on the wall. The long-shot mayoral candidate began around the edges, pointing to the predominantly minority districts along the city’s southwestern border, before circling in toward downtown. “I do see a path,” said McVey, 41, who has never held elected office and raised just $60,000 in the first half of the year, though he loaned himself another nearly $1.1 million. In a city where the political world often feels so small, McVey is the odd exception: an investor who, when he arrived on the local Democratic fundraising scene about a decade ago, was unknown to many of Houston’s longtime political players. His candidacy, too, took some by surprise. “He’s been kind of a mystery man,” said former City Councilman Gordon Quan, for whom McVey previously fundraised. This outsider status is one McVey touts, pitching himself as a businessman with the financial acumen required to spur Houston’s economic development and tackle its looming $126 million budget deficit. On the campaign trail, McVey advocates for filling city coffers, in part by bringing more businesses and residents to Houston, though the city’s revenue cap limits how much it can collect in property taxes from that new growth. He supports issuing bonds to cover the city’s unfunded pension liability – a core issue in this year’s campaign – and often addresses budget gaps with vague references to getting more federal funding. Throughout, McVey cites his experience creating and saving companies. “I know what risk is. I know how to manage. I know how to look for opportunities,” McVey said at a recent mayoral forum. Yet McVey declined to comment on the specifics of many of his investments and companies, saying they were private, and a recent child support case shows his monthly resources were $2,500 as of December 2014. I’ve met McVey, but in keeping with the theme of this story I don’t really know him – I certainly don’t know him as well as the other candidates, and had never heard of him before he announced his candidacy – so I learned a lot from reading this. McVey has a lot of business experience, but it’s not clear how much any of that experience bolsters his case for Mayor. Honestly, and it gives me no great joy to say this, I don’t know what the case for McVey is. As a first-time candidate who wasn’t particularly well-known to begin with, he has no obvious base of support, and he doesn’t check off any box that Chris Bell doesn’t. He’s loaned himself a million bucks – and again, let’s be honest, that’s what separates him from the “minor” candidates – but he hasn’t spent much if any of that money introducing himself to voters. He could start spending it now, but I doubt there’s enough time to make a difference, and unlike a certain other unknown businessman Mayoral candidate who (at first at least) wrote his own check, he wouldn’t have the airwaves to himself. People run for offices for their own reasons, and in my experience most of those reasons are good. McVey’s reasons for running are honorable. I just don’t know what he expects to get out of the experience at this point. They focus on small-dollar donors. A Houston Chronicle analysis of the top seven candidates’ campaign finance filings covering the first six months of the year shows most businesses and special interest groups are waiting for the race to shape up before pushing their chips forward, and shows the top campaigns have each drawn roughly half their cash from wealthy donors giving the individual maximum of $5,000. The most instructive data, political analysts say, comes from grassroots donors giving $50 or less. For one thing, University of Houston political scientist Richard Murray says, there are far more people able to give $50 than $5,000 – and those folks often will cut additional checks to fund the final push to November. Presumed front-runners Adrian Garcia and Sylvester Turner drew the largest share of their contributions from small donors, followed by City Councilman Steve Costello. 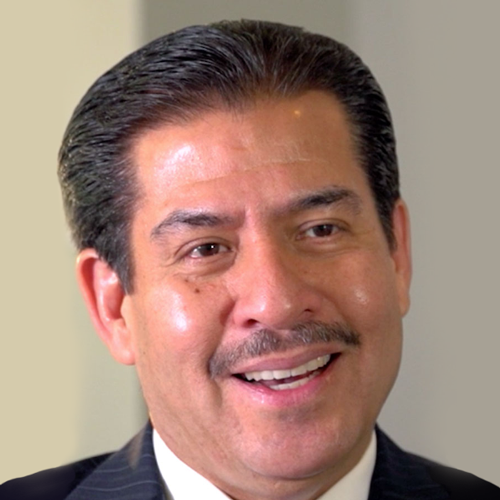 Garcia, the former Harris County sheriff, boasted 315 small donors, a quarter of all contributors to his campaign. Turner, a longtime state representative from north Houston, reported 141 small donors, also comprising about a fourth of his donors. Costello drew a fifth of his donors from the grassroots. This surprised some analysts, who knew only that the moderate-to-conservative engineer was sure to draw business backing. Others said the haul was notable but needed context, given that Garcia entered the race months after Costello, and Turner had just nine days to solicit checks following the end of the legislative session and associated fundraising blackout rules. Though his overall fundraising total was modest, former Congressman Chris Bell also drew a solid group of small donors, with these supporters making up 17 percent of his contributors. Bill King only had 6 percent of his donors come from this small-dollar group, but Mark Jones assures us that doesn’t really mean anything, so don’t go wallowing in existential despair just yet. There’s also a chart that also tallies up contributions from PACs and max donors, or you could have read what I wrote a couple of weeks ago, with more information and fewer expert quotes. Snark aside, looking at the small-dollar donors is a worthwhile exercise that I didn’t have the bandwidth to do. More transparency is good. Lotta money being raised out there, though not quite as much as the topline totals say. Former Harris County Sheriff Adrian Garcia was first out of the gate with his figures, announcing Tuesday that he raised $1.5 million since announcing his candidacy in May. According to his campaign, Garcia neither contributed his own money nor transferred funds from his sheriff’s account. Former Mayor of Kemah [Bill] King followed with a statement Wednesday morning saying he raised $1.25 million, $750,000 of which came from donors, meaning King likely supplied $500,000 for his own bid. [CM Stephen] Costello [who reported raising $1.8 million total] also financed his own campaign to the tune of $250,000 and transferred $262,000 from his city council account, according to his release. 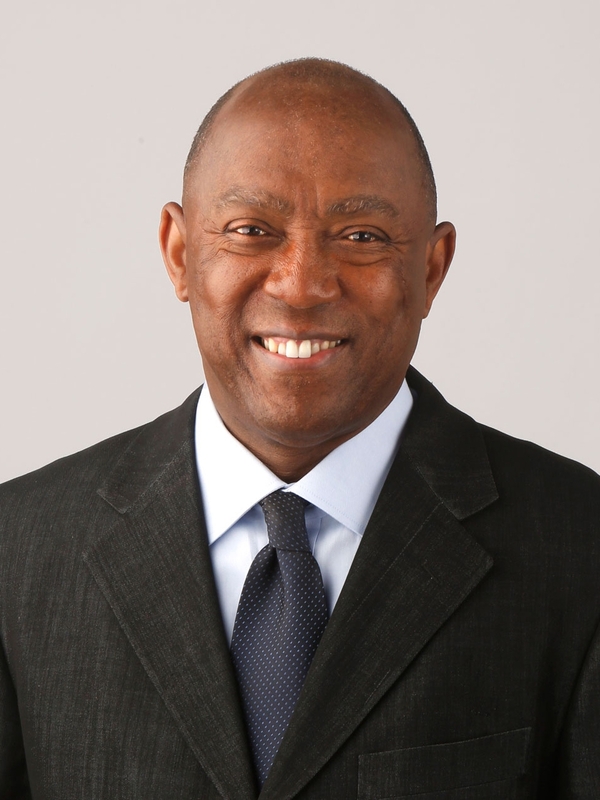 State Rep. Sylvester Turner reported raising $750,000 in the nine days between the end of the state legislative fundraising blackout and the close of the reporting period. 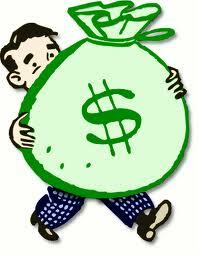 Turner started the race with $900,000 from his legislative account already in the bank. Meanwhile, 2013 mayoral runner-up Ben Hall raised nearly $800,000, according to his campaign, $500,000 of which he donated himself. Former Congressman and City Councilman Chris Bell ended the reporting period with the lowest number of the group, having raised $400,000. 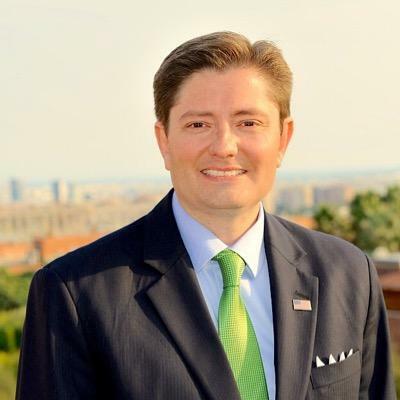 Businessman Marty McVey and others who have filed to run for mayor have yet to release their fundraising totals. 1. Money you donated to your own campaign is not money you raised. It’s real money, and it has a real effect, but it is not the same thing. I suspect that the reported self-donation totals here don’t quite tell the full story, but we won’t know until we see the reports. 2. Not all of those “money raised” figures is actual money, whether self-donated or not. In kind donations often make up a big chunk of some finance reports. Some of that represents real value – donated campaign office space, for example, or food and drink for a campaign event – but a lot of it is just plain puffery. Again, we’ll know when we see the reports. Note that the larger the in-kind donation total, the greater the disparity will be between total raised and total on hand, since in-kind ain’t money. 3. The other factor affecting cash on hand, of course, is how much you spent, and on what. Some campaigns wind up spending a lot more on consultants and other things that don’t exactly equate to voter outreach than others. For now, this is what we know. I will be going over all the reports when they come out, and will have them uploaded and posted to my 2015 Election page for your perusal. I’ll do a few posts summarizing and analyzing what’s in the reports as well. As always, money isn’t everything, but a campaign that can raise it and knows how to use it can be much more effective than one that can’t and doesn’t. Stace has more. It’s all about the conservative voters, because no one cares what anyone else thinks. When the most conservative candidate in the Houston mayor’s race dropped out two months ago, the battle to win over right-leaning voters became a two-man show: former Kemah Mayor Bill King versus City Councilman Stephen Costello. Both candidates bill themselves as moderate fiscal conservatives chiefly concerned about the city’s finances – pensions in particular – and, by all accounts, neither is an ideal choice for the far right. Nonetheless, support among local Republicans has begun to coalesce around King, who has taken a hard line against ReBuild Houston, the city’s controversial streets and drainage program. Now, with Houston recovering from severe flooding and the state Supreme Court ruling against the city in a lawsuit over ReBuild, program mastermind Costello only looks to be in trouble. “The timing of this couldn’t be worse for Costello,” said Rice University political scientist Bob Stein, adding that King now has a window to break through. ReBuild Houston is designed to allow the city to pay down existing debt while financing drainage and road improvements primarily through monthly drainage fees collected from property owners. Earlier this month, hours after the Texas Supreme Court ruled the language of the 2010 charter amendment did not adequately describe the drainage fee to fund ReBuild, King released a statement attacking the program and Costello. Last week, he called for ReBuild to be put back on the ballot this November. Meanwhile, candidates to King’s left barely have touched on ReBuild. Yes, it would be nice to hear what Adrian Garcia, Chris Bell, and Marty McVey have to say about this. It’s been more than a week, guys. What kind of race are you running here? I don’t even know what to think. As for this story, it’s an expanded version of the one I blogged about Saturday, in which King called for a revote on the Renew Houston proposition, with more quotes from his and Costello’s campaigns and various Republican types. I won’t repeat myself, so I’ll just take a moment to marvel at how issuing debt is now considered the preferred “conservative” choice over pay-as-you-go. Given the way debt has ballooned at the state level and the fact that this particular PAYGO plan involved creating a new revenue stream instead of cutting something or pretending to cut something, I suppose I shouldn’t be surprised. I’m going to wait to hear what a court says about the status of the current litigation before I get too deep into all this. I hope to hear what the rest of the Mayoral field has to say before then. To be expected at this point. A class action lawsuit has been filed against the city, seeking to reimburse residents who pay the drainage fee that helps fund ReBuild Houston, the multibillion-dollar streets and drainage improvement program that voters narrowly approved in 2010. The lawsuit comes on the heels of a Texas Supreme Court ruling issued Friday that found that the ReBuild ballot measure failed to disclose the cost of the drainage fee to the public. The case has been sent back to trial court, where plaintiffs expect a swift victory and legal experts said it’s likely a judge will honor the Supreme Court ruling. Andy Taylor, attorney for the plaintiffs in that case, is also behind Wednesday’s class action suit. The named plaintiff, or class representative, is resident Elizabeth Perez, one of the plaintiffs in the original ReBuild suit. In order for the class action suit to move forward, a judge must agree that there is a group of similarly disadvantaged people, constituting a “class.” Taylor is attempting to include all residents who receive a water bill to which the drainage fee is tacked on every month. His argument hinges on the idea that property owners were “under duress” when they paid the drainage fee because they could have their water shut off if they failed to do so. See here for the background. Is there a form I can fill out to attest that I’d sooner have an arm gnawed off by wombats than consent to be legally represented by Andy Taylor? Because while I have no doubt that there are many homeowners who would like to get a refund on their drainage fees, there are plenty – like me and the commenter on this Chronicle story – who are happy to have paid a few extra bucks each month to help fund infrastructure improvements, however imperfectly they were done. If Andy Taylor tries to claim that all homeowners were coerced into paying the fee, then he deserves to lose, because he sure as hell doesn’t speak for me. A later version of the story suggests Taylor’s actions are indeed odd. In order for the class-action suit to move forward, a judge must agree that there is a group of similarly disadvantaged people, constituting a “class.” Taylor is attempting to include all residents who receive a water bill, to which the drainage fee is tacked on every month. His argument hinges on the idea that property owners were “under duress” when they paid drainage fees because they could have their water shut off if they failed to do so. City Attorney Donna Edmundson called the class action lawsuit “very premature” because the trial court case over the legality of the ReBuild ballot measure hasn’t been resolved. Without establishing that the fee is illegal, Taylor’s class action suit would be moot. Stanford law professor Deborah Hensler said Taylor’s case is ambitious because he is not only seeking to halt the fee, but also to reimburse residents going back five years. The sheer logistics involved in repaying residents and the financial hardship to the city could factor into a judge’s decision even if the legal case is sound, Hensler said. “Most judges are sensitive to the size of the damages,” Hensler said. Well, no one has ever said Andy Taylor doesn’t reach for the stars. He seldom gets there, but he does reach. We’ll see what a judge makes of it. On a related note, I went and checked the Facebook pages and Twitter feeds of each of the five candidates for Mayor who had not made a statement about the Supreme Court ruling as of my previous post. Here’s Sylvester Turner’s statement, posted on June 15 at 11:44 AM. The other four – Chris Bell, Adrian Garcia, Marty McVey, and most puzzling to me Steve Costello still had nothing to say on the subject as of last night. I will ask again: What are you waiting for? Houston’s divisive, multibillion-dollar effort to fund two decades of street and drainage improvements faces an uncertain future after the Texas Supreme Court ruled Friday that the ballot measure voters narrowly approved in 2010 obscured the nature and cost of the drainage fee at the heart of the ReBuild Houston program. The case now returns to the trial court level, where experts say the justices’ strongly worded opinion appears to make a victory for the city unlikely. At issue was whether the ballot language made clear what voters were being asked to decide. “The city’s semantic obfuscation is particularly egregious here, considering that the ballot proposition at issue concerned a revenue-raising measure,” Justice Eva Guzman wrote, having taken the extra step of penning a concurring opinion to accompany her colleagues’ ruling. Though the final outcome is far from certain, the possible absence of the largest of ReBuild Houston’s four sources of revenue – the hundreds of millions of dollars Houstonians have paid through the drainage fee – would greatly undermine the city’s infrastructure repairs. As of this spring, $655 million had been spent or earmarked for new projects under ReBuild Houston, with almost 100 projects completed. That work includes 515 miles of rebuilt or repaved streets, 697 miles of ditches graded and 188 miles of storm sewers cleaned – all while paying down old debt, supporters say. Conservative activists, however, cheered Friday’s ruling as fervently as they long have railed against the drainage fee, which they deride as a burdensome “rain tax.” The lawsuit in question concerns a related criticism: that the ballot language was misleading, making the charter amendment illegal. Houston appellate lawyer Richard Hogan, who is not involved in the litigation, said a separate legal action would have to be launched to make the drainage fee disappear from residents’ water bills. However, after reading the Supreme Court opinion and related filings, Hogan said he would put his money on an eventual victory for the plaintiffs. I have a copy of the opinion here. I’m still mulling this over, but for now I have three thoughts. 1. I freely admit this may just be sour grapes on my part, but I have a hard time seeing this ruling as anything but ridiculous. I don’t know how any actual voter who didn’t spend the last six months of 2010 in a coma could have failed to understand that voting for the Renew Houston proposition meant imposing a fee on themselves. I’m struggling to not see politics at the root of this decision. 2. So far the only Mayoral campaign reactions I have seen to this have been press releases from Bill King and Ben Hall, both of which hit my mailbox on Friday, and both of which were happy about the ruling. 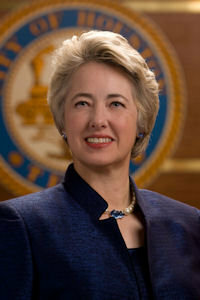 (Mayor Parker also put out a press release, which was quoted in full in the Chron story.) I’ve looked at the Facebook pages of the other five candidates, and so far nothing. Chris Bell, Sylvester Turner, Steve Costello, Adrian Garcia, and Marty McVey – what are you waiting for? 3. There’s still a lot of legal wrangling to come, but it’s fair to say that ReBuild Houston is on life support and may not survive. If it goes down, then what if anything replaces it? I feel like I spent a lot of time back in 2010 asking Renew Houston opponents what they would do to provide more funds for flooding and drainage improvements, and I never got anything resembling a coherent answer. So I’ll ask again, with an eye especially at the Mayoral candidates. If not ReBuild Houston, then what? How do you provide more funds to do more street repairs and flood abatement? Remember, we live in a revenue cap world, so simply proposing a property tax increase (not that anyone would, I suppose) is insufficient. If you don’t propose some kind of supplemental revenue stream, then as far as I’m concerned you’re not serious about wanting to do street improvements and flood mitigation. If you do have a proposal, then I want specifics, and I want to see evidence that you’re going to fight for it. Say what you want about Steve Costello, and I’m sure he’s going to take his fair share of abuse and criticism now, but he put his money where his mouth was in 2010, and he got something passed. If the Supreme Court has taken that away, what will you do instead? The third Mayoral candidate forum on Saturday was supposedly about “labor and workers’ rights”, but of course the story is all about the great and powerful pension question, because there’s been so little coverage of it and where the candidates stand on that question is such a mystery. There is a bit at the end of the story about those other boring issues – hilariously, it’s in a smaller font without any spacing between the paragraphs, as if to emphasize the afterthought nature of it – and being the stubborn SOB that I am, that’s what I’m going to highlight here. In a normal-sized font, with spacing added, thankyouverymuch. Bell said at least twice that he would put a labor liaison on his executive staff as mayor and also stressed the need to address growing economic inequality in Houston. “If we don’t address this issue we’re going to continue to have a city of haves versus have-nots,” he said. Costello focused several times on worker training. He advocated the use of “best value” rather than “low bid” selections in city contracting to enable the city to better penalize irresponsible companies that cut corners. On affordable housing, he advocated for the city to provide more incentives to developers to avoid gentrification, and for similar efforts creating an affordable district for artists. Garcia: Touted his efforts while on City Council to get vaccines to Latino kids in his district when he learned his district had one of the city’s lowest immunization rates. He focused heavily on affordable housing and gentrification, and said the city must find ways to prevent citizens from paying for their neighbors’ investments in their own taxes. Hall said he would give preference in city contracting to companies that provide apprenticeships and said he would pursue policies to “grandfather” existing homes in gentrifying areas to prevent residents from being pushed out. King: Said he would work to increase the number of and funding for Federally Quality Health Clinics, and would evaluate whether city clinics unnecessarily duplicate services with county clinics. He said any contractor caught stealing workers’ wages should be fired and banned from doing business with the city. McVey said because the Legislature has blocked the expansion of Medicaid under the Affordable Care Act, the city should seek a way to get payments directly from Washington. McVey also called for more urban planning, with a focus on preventing gentrification. Turner touted his support in the Legislature for expanding a health insurance program for impoverished youth and for increased funding for trauma centers, and took issue with an expansive subsidy program launched under Parker to pay developers $15,000 per apartment or condominium built downtown; “It’s about time we pushed that to the neighborhoods,” he said. See, now wasn’t that interesting? Combine that with the first two forums, and you might have actually learned something you didn’t already know about what the candidates believe. Even if none of the questions I wanted to see asked got brought up. There’s still time for that, though. PDiddie has more. They talk about the arts. The second question addressed whether the candidates would support additional funding for arts education, with the final moderator-posed question touching on whether the candidates would see through Parker’s cultural plan. It is currently being created and is intended to guide Houston’s arts and cultural development in the coming decades. CultureMap filled in the third question. While much of the evening was taken up with policy wonk questions about a cap on the Houston Hotel Occupancy Tax (aka the HOT tax), which funds arts projects around the city, the best — and most humanizing question — came from an audience member, who asked, “Who is your favorite artist and why?” You could almost see the wheels turning in each candidate’s head as he scrambled to come up with an unscripted answer. First up was former Kemah mayor Bill King, who lamely listed Van Gogh, whom he first learned about from his history teacher many years ago. Businessman Marty McVey picked the 13th century poet Rumi for the “great solace” his work provides, which drew applause of one audience member. State Rep. Sylvester Turner was the first to turn the discussion to Houston artists — John Biggers and Michelle Barnes are among his favorites, and the other candidates quickly followed his lead, with Bell listing Lamar Briggs, Houston City Council member Stephen Costello mentioning Mark Foyle, muralist Ashley Winn and Justin Garcia, and former sheriff Adrian Garcia picking his daughter along with Project Row Houses founder Rick Lowe. Attorney Ben Hall had the most unconventional answer — he’s mad about Surrealists M.C. Escher and Salvador Dali. “Read into that what you may,” he said cryptically. I’d have gone with Beans Barton myself, though I have to admit that MC Escher is a fine answer if one doesn’t care about local pandering. Nancy Sims and Texas Leftist also reported on this forum. Next, they talked about the budget. Houston mayoral hopefuls swapped plans to shore up the city’s finances at a forum Thursday, pledging everything from pension reform to scrapping the city’s crime lab. The event drew little in the way of political fireworks, with the rival candidates largely sticking to their own talking points at the University of Houston student center. More than 200 people were in attendance. The forum was hosted by SPARC Growth Houston, a coalition of economic development groups that encircle the downtown core SPARC representatives asked six of the candidates jockeying to replace term-limited Annise Parker four questions, giving them 90 seconds to respond. The seventh candidate, Ben Hall, the mayoral runner-up in 2013, was not present Thursday. The questions from SPARC largely focused on how the candidates would spur economic development in neighborhoods to the north, east and south of downtown. The first question, however, broached how the candidates would curb the city’s looming budget deficit and drew more specific answers. Looks like the candidate for people who thinks the revenue cap is stupid is Chris Bell, with Sylvester Turner the runnerup. There’s another forum this morning at Talento Bilingue in the East End to focus on labor and community issues, and there will be many many more after that. 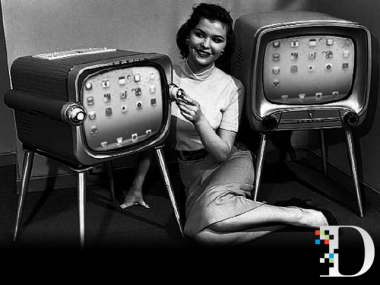 Find one that appeals to you and go hear what the candidates have to say for themselves. PDiddie has more. Another day, another Mayoral hopeful. 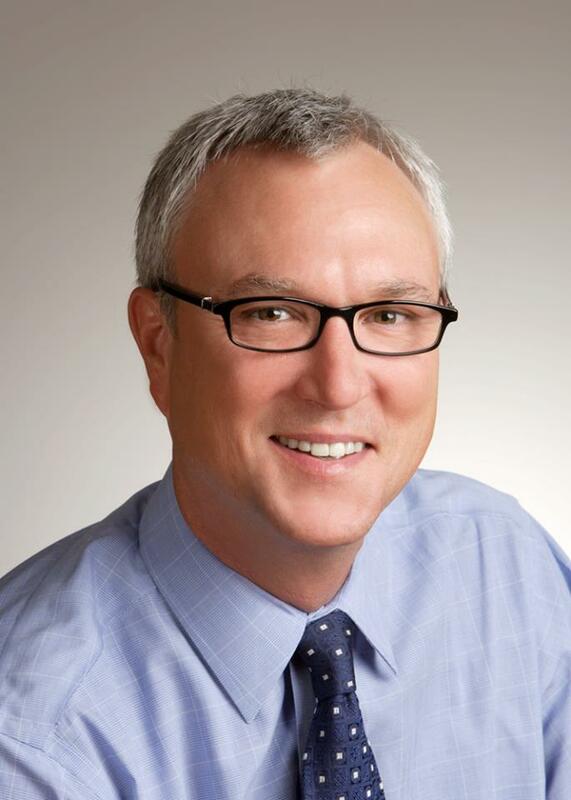 Private equity executive Marty McVey said Thursday he would reinvigorate Houston’s international business ties if voters elected him mayor this fall. The White House in 2011 appointed McVey, who has donated to many Democratic political campaigns, to an advisory board for the United States Agency for International Development. McVey said that economic development stimulated by international trade would bring in the dollars to allow the city to address its most pressing problems. “We don’t have the ability to fix the potholes and fix the pensions because the city doesn’t have the revenue to do so,” McVey said. McVey said he would bolster the city’s economic development office and recruit international businesses to Houston, adding that he drew policy inspiration from former Gov. Rick Perry. I had the opportunity to meet McVey yesterday, and I look forward to hearing more from him. His campaign webpage isn’t up yet, but his Facebook page is here and his Twitter feed is here. As far as recruiting businesses to Houston goes, I doubt anyone objects to that, but it’s my opinion that the best way to do that is to make progress on some of those problems we need to solve, like mobility and quality of life. McVey will have a challenge getting his message out in a crowded field of experienced candidates, but if that message is good enough I for one will be listening.